No, The Families of the Benghazi Murdered Are Not Against a Select Committee | Just Bunk! Weasel Zippers does a great job of tearing Pelosi, and her claims, to shreds. What, exactly, does “Please don’t take us down this path again” mean? Does it mean: “Please don’t have the State Department investigate the State Department again”? Does it mean: “Please don’t tell us we’re going to get answers this time then whitewash it like the last times”? Does it mean: “Please don’t conduct another investigation where Hillary Clinton refuses to testify and none of the survivors are interviewed”? 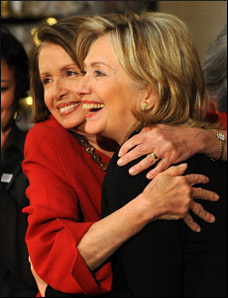 Did the families even tell Pelosi “Please don’t take us down this path again” at all? None of them have gone public with such a request. It’s a dubious claim, at best. In contrast, the families of Sean Smith and Ty Woods have gone public and been very vocal about the lack of answers and obfuscation by the White House and State Department, and both desperately want further investigation into the murder of their sons. Two of the families of the four men abandoned and killed in Benghazi strongly support further investigation. The other two families have remained silent throughout the ordeal. So, Nancy, how does that translate into “The families don’t want the Benghazi Select Committee”? That Pelosi would lie and use the families of the slain to effect political cover for Democrats is nothing new. Disgusting, but nothing new. Not true. The families never said that, Nancy Pelosi did. The families want answers. The democrats have used tragedies to fund raise. Sandy Hook for example. Absolutely correct on both counts. All parties fundraise on issues important to their base. Democrats also beat Iraq into the ground in fundraising emails. I know – I get them. It’s a specious and desperate argument. Thanks for the comment.